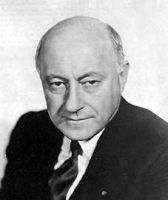 Cecil Blount DeMille was a legendary American film director and Academy Award-winning film producer in both silent and sound films. He was renowned for the flamboyance and showmanship of his movies. Among his best-known films are The Ten Commandments (1956), Cleopatra (1934), and The Greatest Show on Earth (1952), which won the Academy Award for Best Picture.